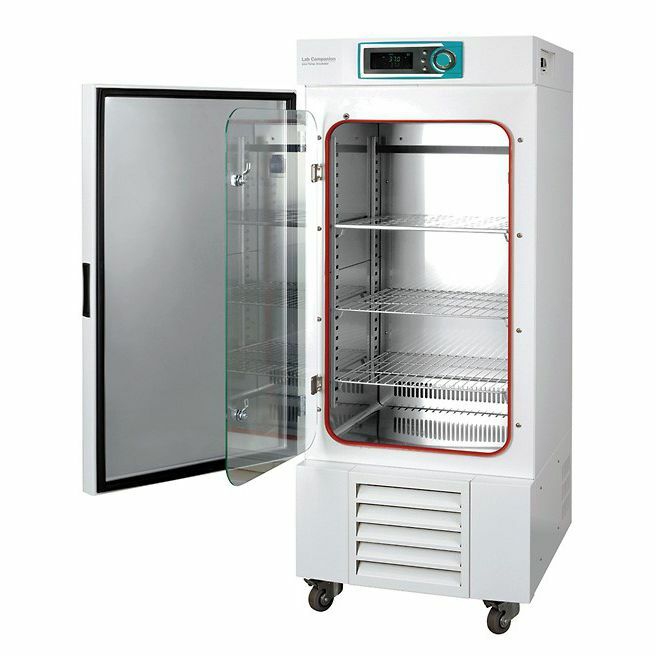 These low temperature incubators provide optimal incubation in the 0 to 80°C (32 to 176°F) range. Microprocessor PID control utilizes a quick adjustable dial knob and temperature parameters are easy to read on the bright VFD display. Controls include dual wait on/off timer modes that van be set from 1 min to 99 hrs. 59 min. or utilize the preset function that saves your three most commonly used temperature setting. Externally control or collect necessary data with the built-in RS-232 and USB ports. Three-point temperature calibration and automatic tuning keep your incubator in peak operation. A built-in electrical outlet with safety cover allows use of shakers or other instruments within the chamber. Inner tempered-glass door makes monitoring samples easy without affecting the temperature within the chamber. Cleaning the unit is simple with rounded corners in the chamber and a quick-release front grill for access to the compressor. Safety features include, automatic run after power interruption, over-current protection, keypad lock function prevents accidental changes during operation, and an audible and visible alarm alerts you if the door is open. A triple independent temperature monitoring system has a high/low deviation alarm, high/low electronic temperature limiter, and a mechanical over-temperature limiter.